The Publishing Prize follows the lead of several international awards events in hosting its ceremony in Stockholm. What is the nature and attraction of this city, and why might you want to come? Stockholm is the capital of Sweden, and home to one in five of Sweden’s 10 million inhabitants. A leading centre for finance and corporate headquarters, Stockholm combines beauty, culture and business, and generates a third of Sweden’s GDP. The infrastructure includes the world’s longest fibre-optic network (1.2 million km, with 100% of public housing connected), and a 100-station metro system which has been called the world’s longest art gallery! Stockholm was founded as a city in 1252, on an easily defended group of mid-stream islands. The old city (Gamla Stan) is a favourite with visitors with its quaint alleyways, cobbled streets, and iconic architecture. This is the home of Stockholm’s Lutheran cathedral, the Nobel Museum, the Royal Palace, the Parliament House, and many other historic buildings including churches, mansions and palaces. And nice cafés! As Stockholm expanded over 14 islands and onto the north and south shores, it gained many fine baroque buildings – especially in the seventeenth century, when Sweden became a regional superpower. The imposing City Hall (picture above) with its red brick tower is the venue for the annual Nobel Prize banquet, hosting about 1,300 people, including the Royal Family. 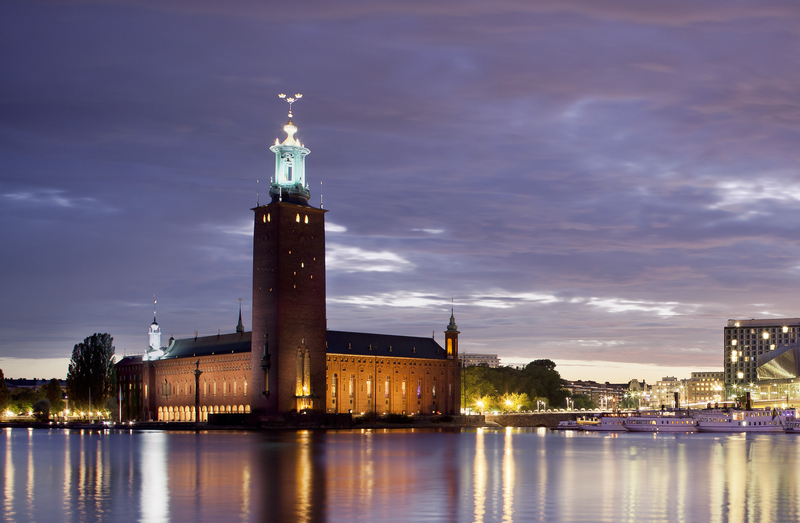 There is plenty to do and see in Stockholm. Popular with locals and visitors alike is Skansen, a 75-acre open-air museum on a city centre island, with 150 old Swedish houses and buildings, brought together and rebuilt on site. In a replica of a 19th century town centre, re-enactors demonstrate crafts such as baking, shoemaking and printing. An open-air zoo specialises in Scandinavian animals including lynx, wolves, reindeer and of course the moose, which in Sweden is called an ‘elk’ (älg). Not far from Skansen and on the same island you will find the Vasa Museum, the most visited museum in Scandinavia. It displays the warship Vasa, which sank in 1628 on her maiden voyage and was salvaged almost intact in 1961. ‘ABBA: The Museum’ is nearby, with interactive exhibits about the chart-storming music group. There are many other museums and galleries in Stockholm, of which 19 have free entry. The Nobel Prizes: Alfred Nobel, the inventor of dynamite, left the fortune he made to fund annual prizes in Physics, Chemistry, Medicine, Economic Sciences, and Literature. Polar Music Prize: Founded by ABBA’s manager Stig Anderson, this ‘Nobel Prize of Music’ honours one contemporary and one classical music individual or organization each year. The Astrid Lindgren Memorial Award (ALMA): In memory of the children’s author and creator of the character ‘Pippi Longstocking’, this richly funded annual prize from the Swedish Arts Council goes to authors and illustrators of literature for children and young adults. Conrad Taylor is a writer and designer who lives in London, but has made numerous visits to Sweden and Stockholm. He was for many years a juror in a UK publications award similar in aims to The Publishing Prize.